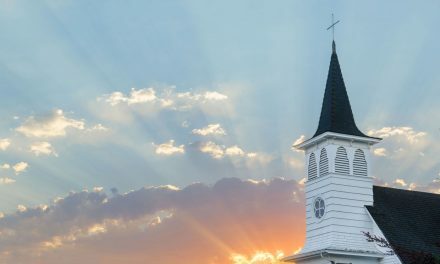 If you clicked on this article, we probably don’t need to convince you of the importance of church bulletins. 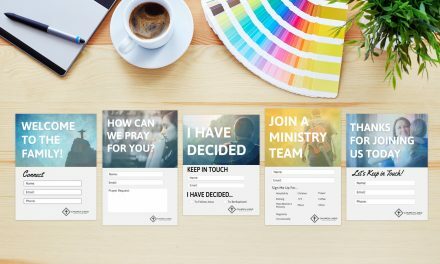 You wouldn’t be signing up for free church bulletin templates if you didn’t believe that the bulletin has an important place in your church’s outreach. 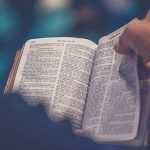 Some have argued that the printed church bulletin is on its death bed and that churches ought to embrace a new way of making announcements. 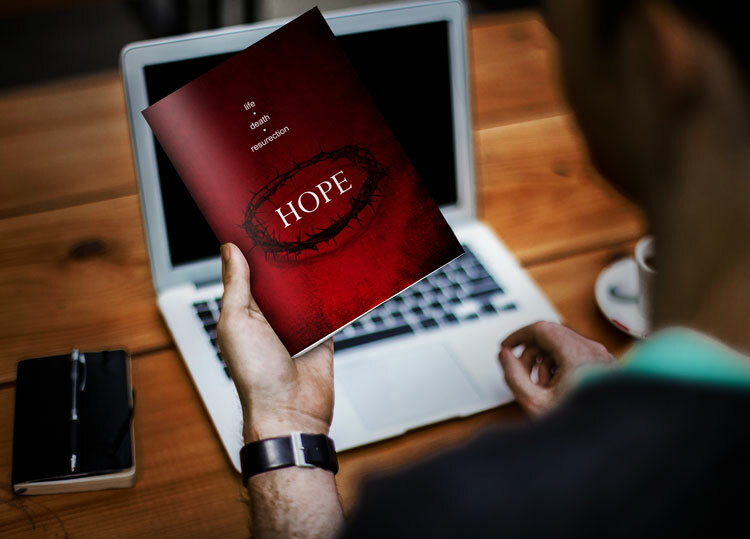 But as church marketing expert Steve Fogg has pointed out, a printed bulletin is a great tool to communicate to first-time visitors and is helpful for people still finding their way into your church. 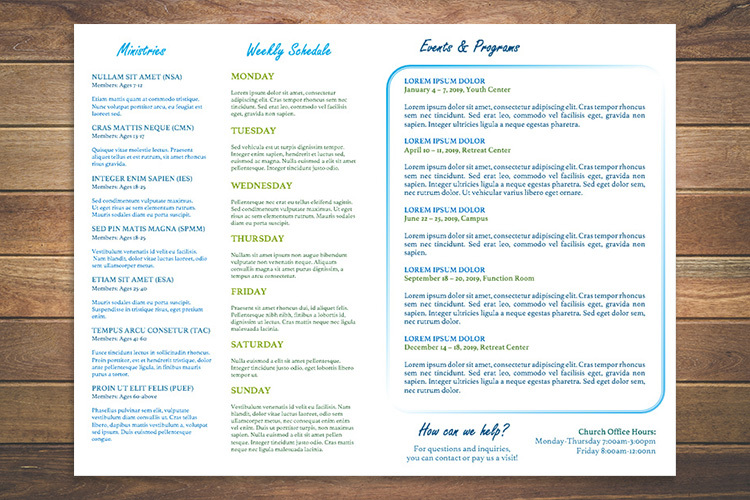 Many visitors and even regular attenders expect to receive a printed bulletin when they are greeted at your church. 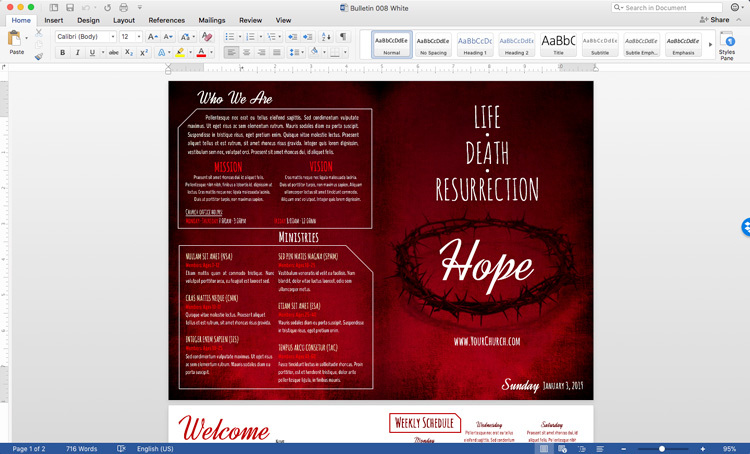 And you want to make sure that your church bulletins make the best impression possible. 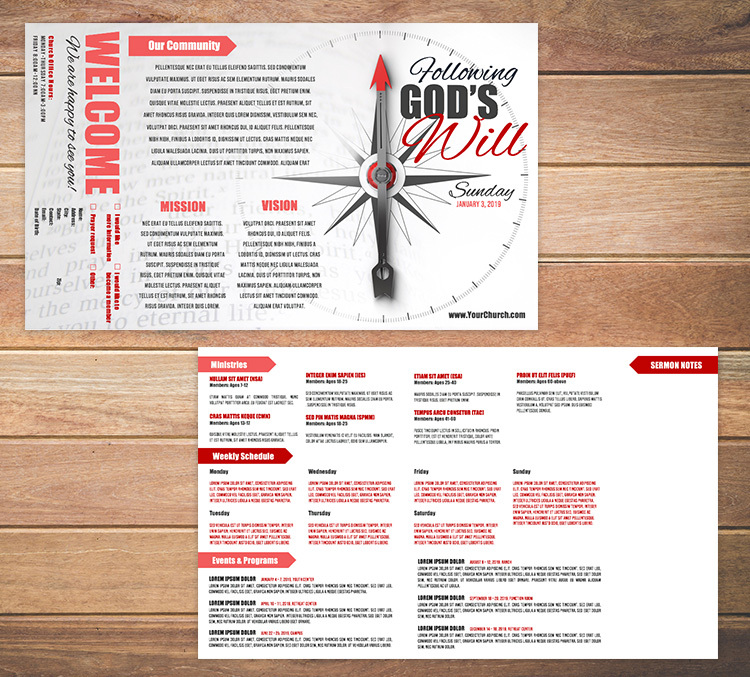 Which is why we’ve created the 8 free church bulletin templates below: to help you get started creating your own attention-grabbing bulletins that will effectively communicate with your congregation. 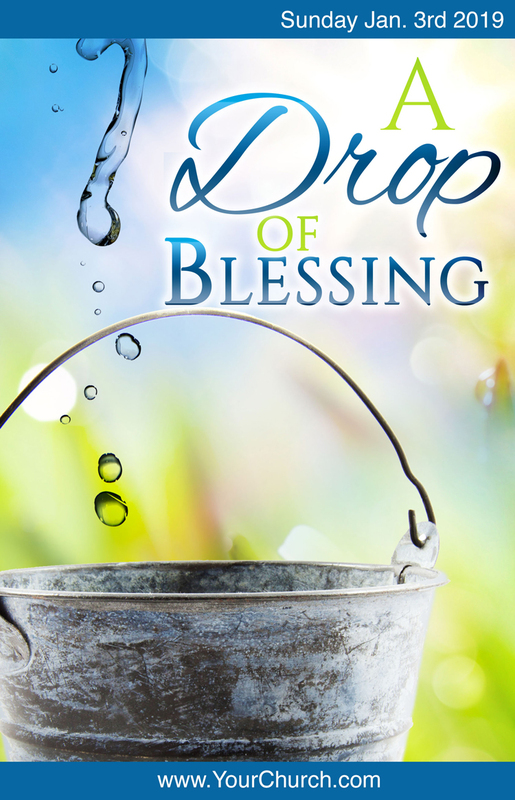 Ready to Breathe Some Life Into Your Church Bulletins? It goes without saying, but we’ll say it anyway: your church is unique. 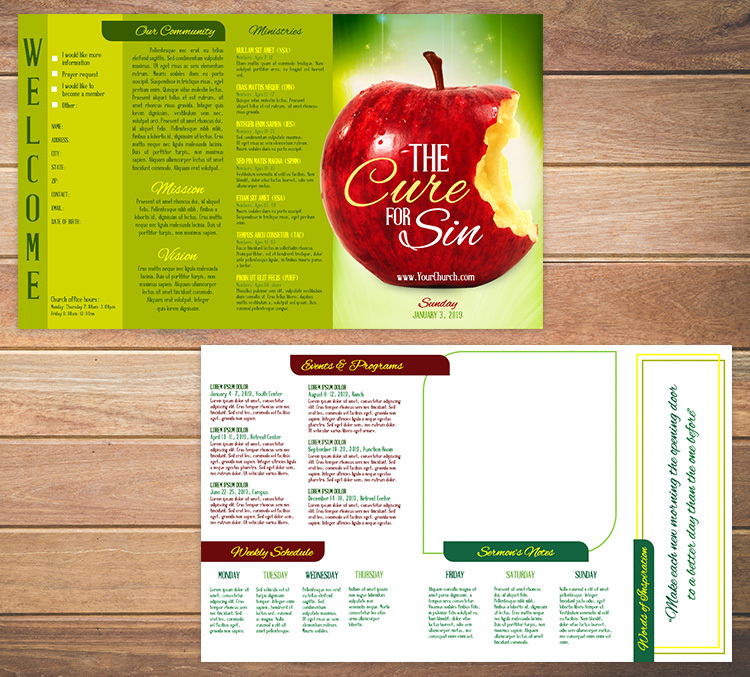 Which means that your bulletins should be customized to fit your church’s needs and audience. 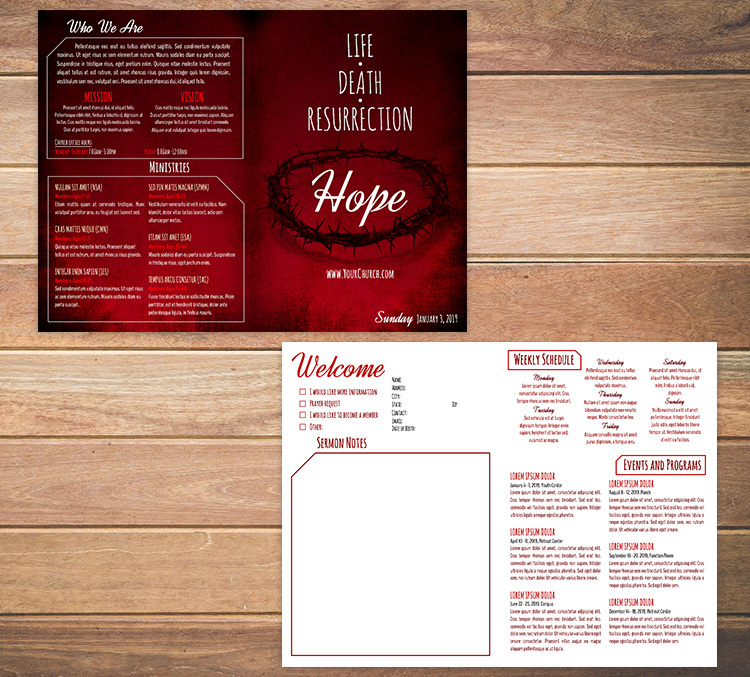 This is the value of having bulletin templates that you can easily customize: they give you a helpful starting point but allow you to make needed changes until you have the bulletin that’s perfect for your church. 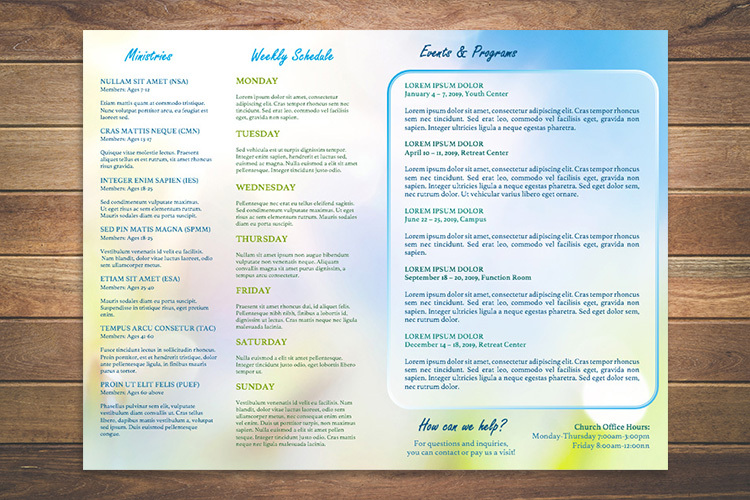 Each of our bulletin templates is 4-sided, consisting of a cover that was designed by a professional graphic designer, two interior pages with a variety of information, and a back with additional information. 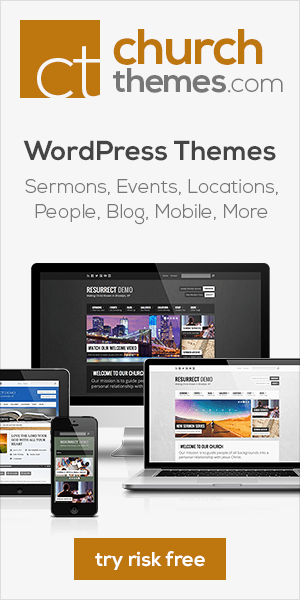 The templates feature many content options to choose from, including a sermon notes section, a weekly schedule, information about your church, an events sections, and an area for visitors to share information. 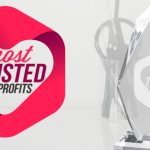 Each template is completely unique in its design, presenting you with a variety of options to choose from. Created to be easy for everyone to edit, the templates were built in Microsoft Word and can be edited using this software. 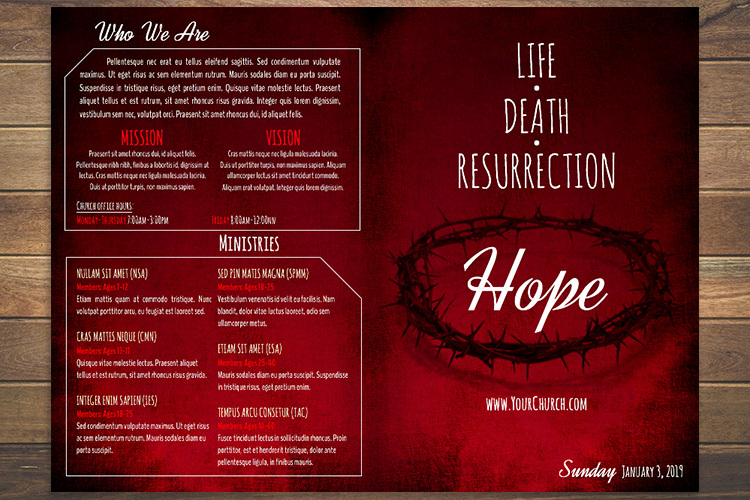 Hopefully these images give you a glimpse of how our free church bulletin templates will help you craft professionally-designed bulletins. And without eating into your budget! 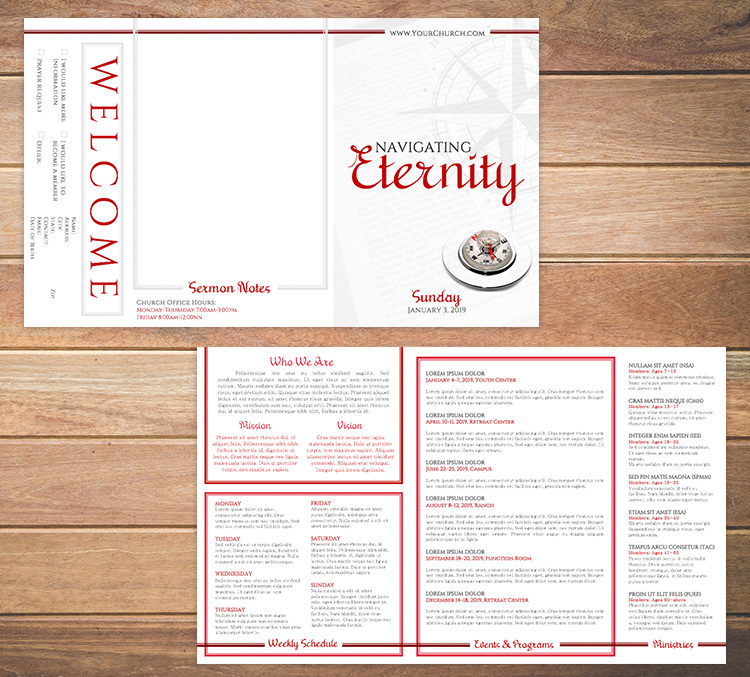 Each bulletin template includes interior pages with a background to match the front and back. We think this brings the design of the templates to life. 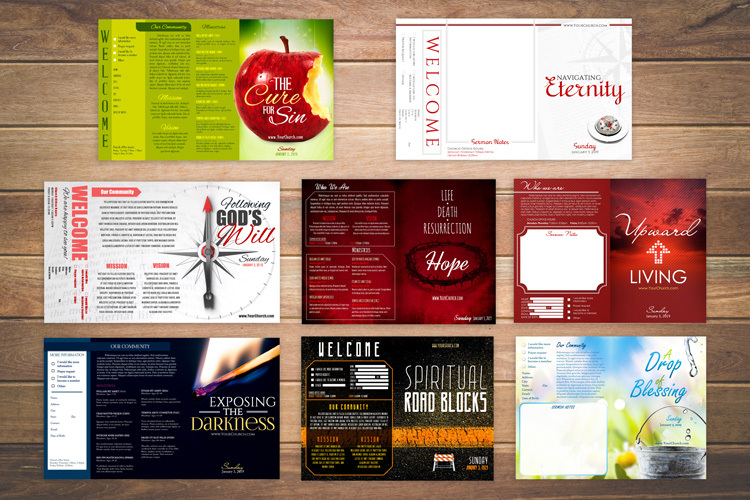 As a part of our gift to you, we’ve also included 8 PSD files for bulletin covers based on the front of each bulletin template. 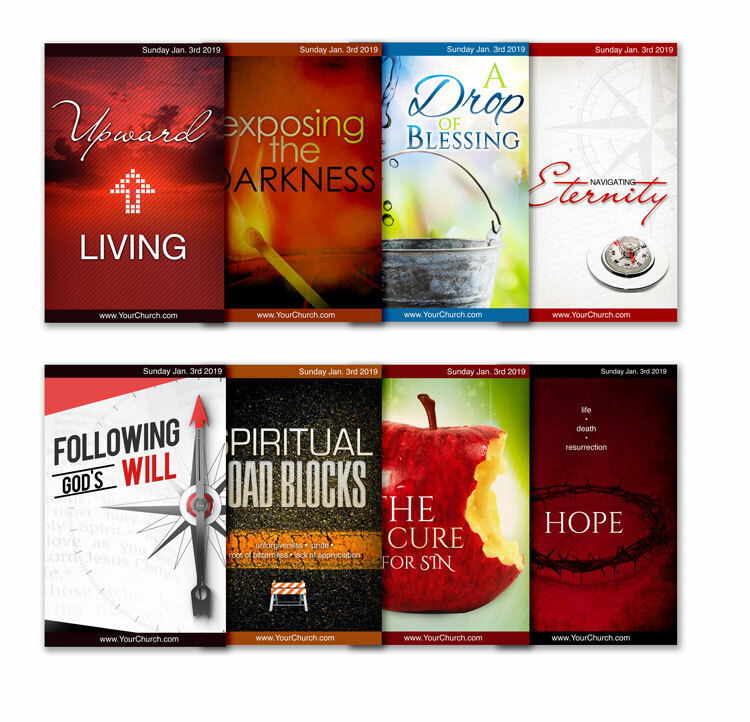 These covers can be customized to be used for more than just bulletins: tracts, brochures, even book covers! The choice is yours. And they’re included in your download as a bonus gift. 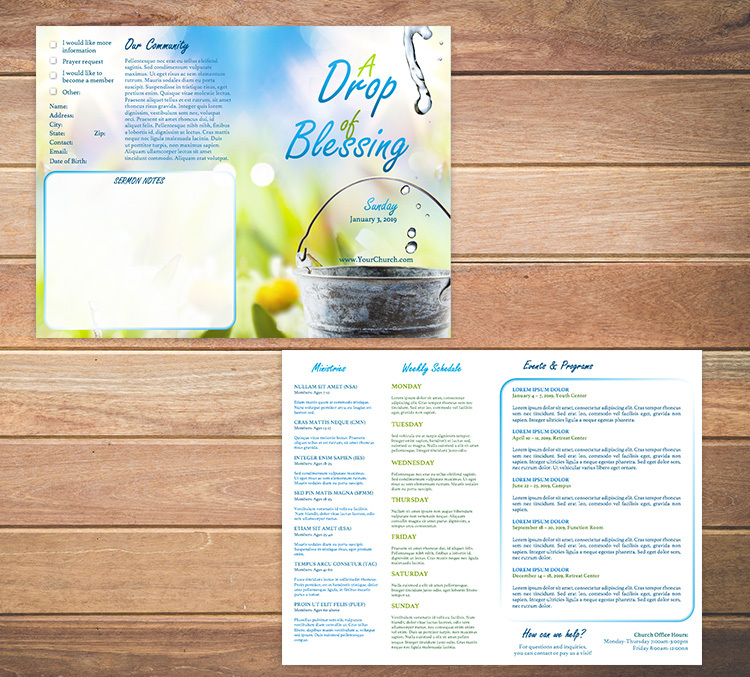 These covers are perfect for those who already have a bulletin format they like and are only looking for a professionally-designed cover for their bulletins. 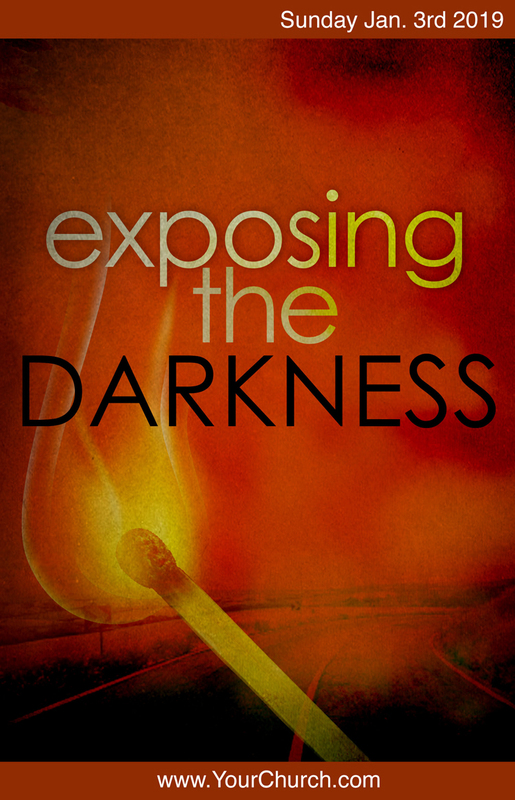 An example of when you might just want to use a custom cover is during a special sermon series. 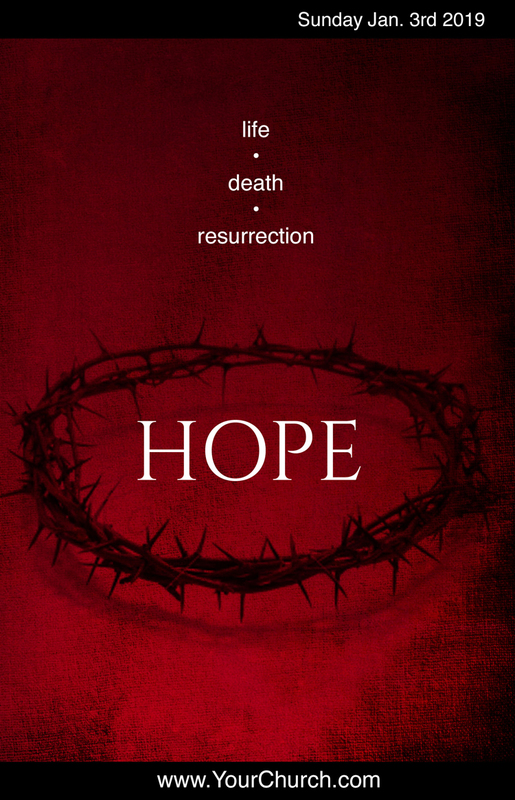 These covers were created using Photoshop. 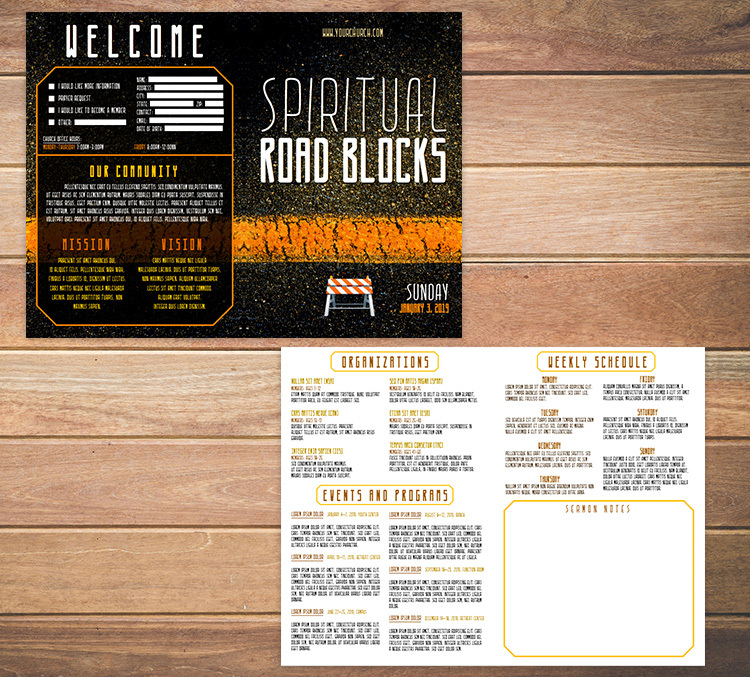 This means that they’re easy to customize until they fit your church’s style and message. Photoshop is very affordable. And it’s easy to use. 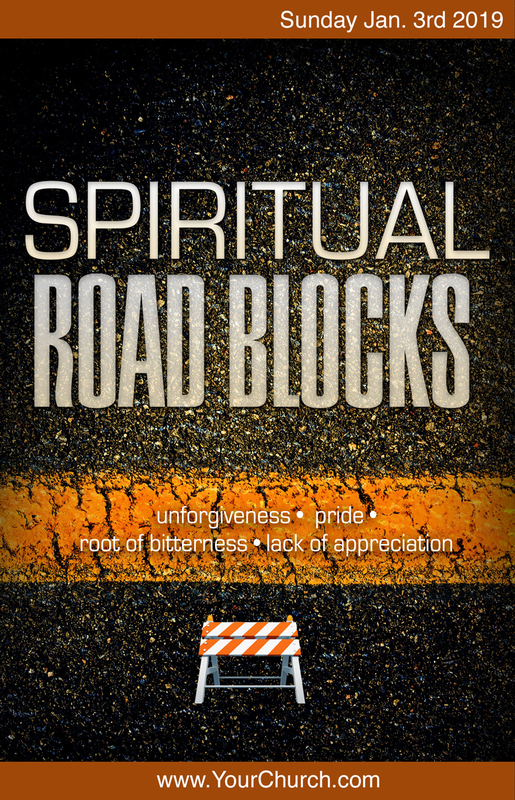 If you don’t have access to it, there’s probably someone in your church who does! 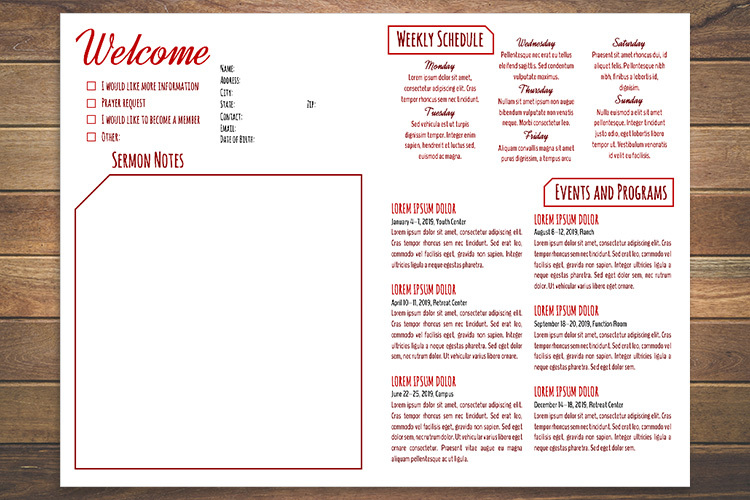 All you’ll need to do to customize each bulletin cover is replace the domain at the bottom, the date, and the title. 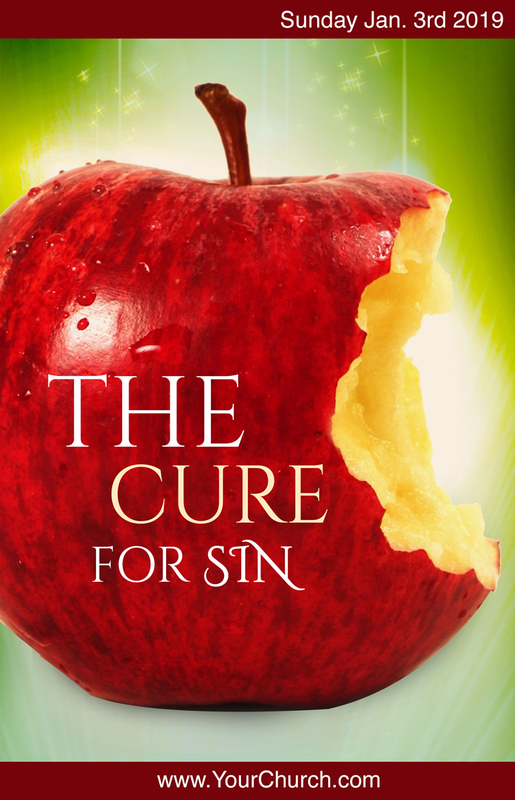 You can tweak the covers until they fit your message, or you can just use them as inspiration and a starting place to design your own inspiring covers. The choice is yours! 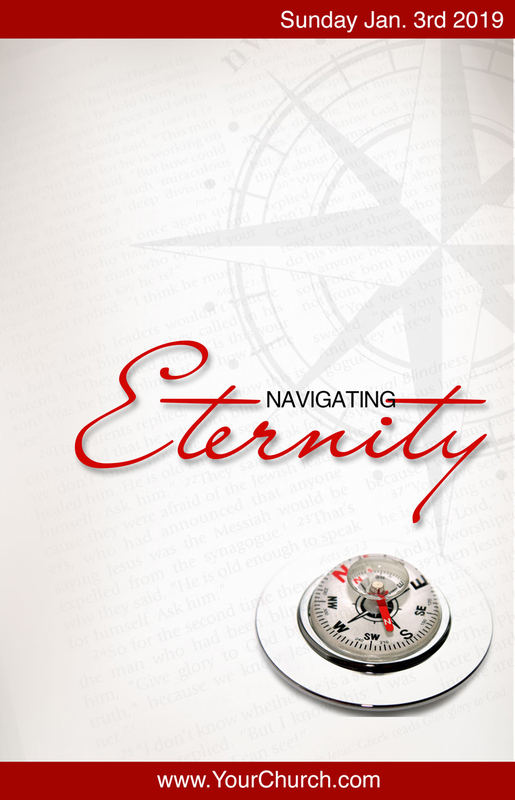 Good branding goes a long way in helping churches communicate. 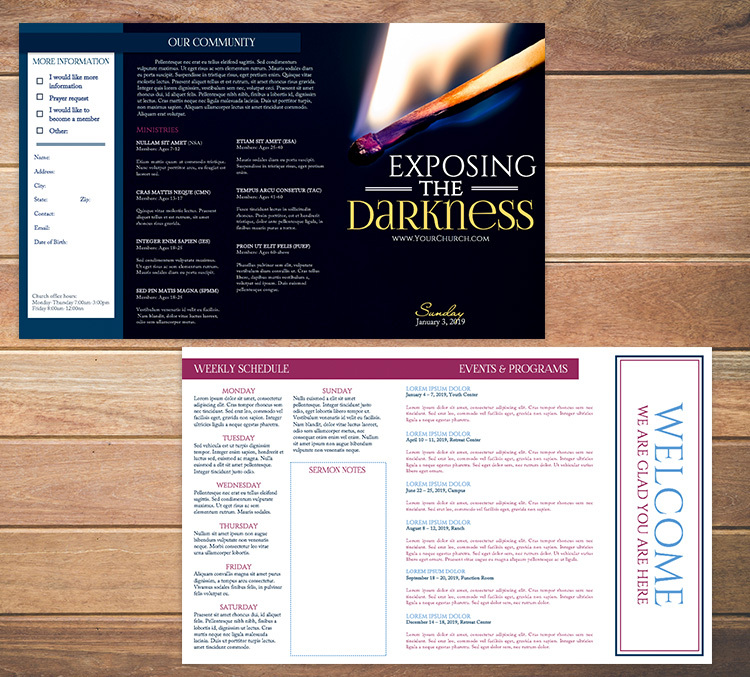 Professionally designed bulletins can have a lasting impact on a person’s opinion of your church. 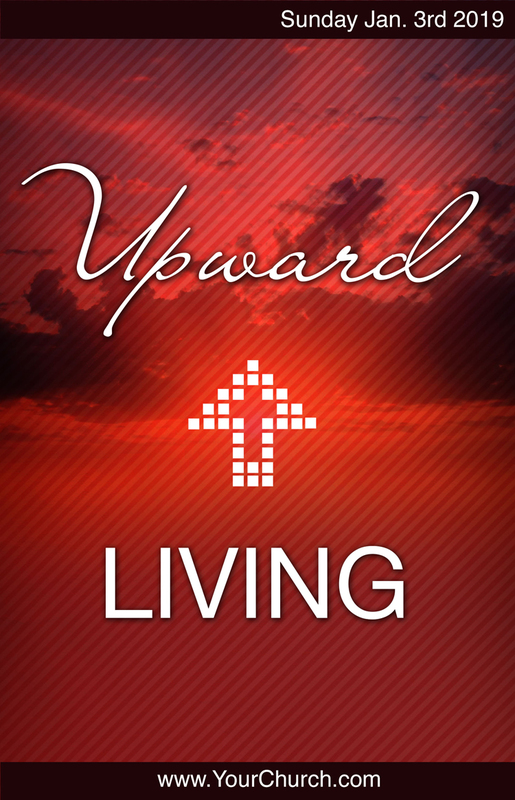 They can even improve the way your congregation sees themselves as a church body, shaping their values and vision. 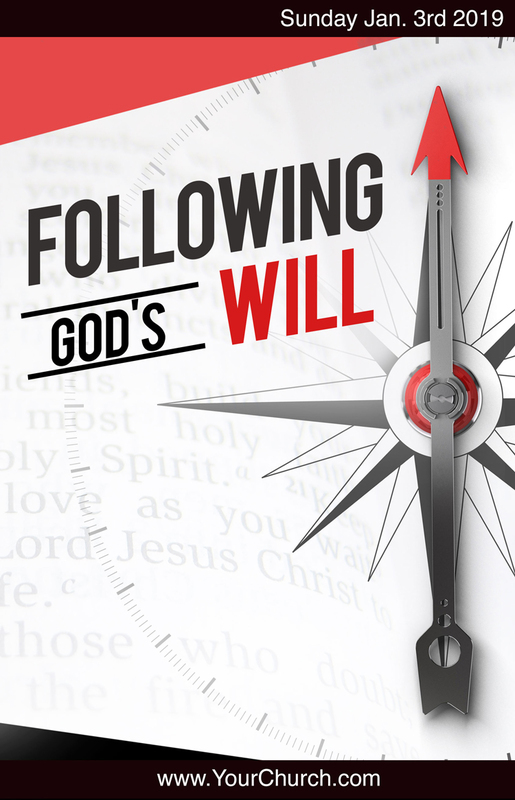 Don’t be surprised if people in your church feel more confident sharing these new church bulletins with neighbors and friends! 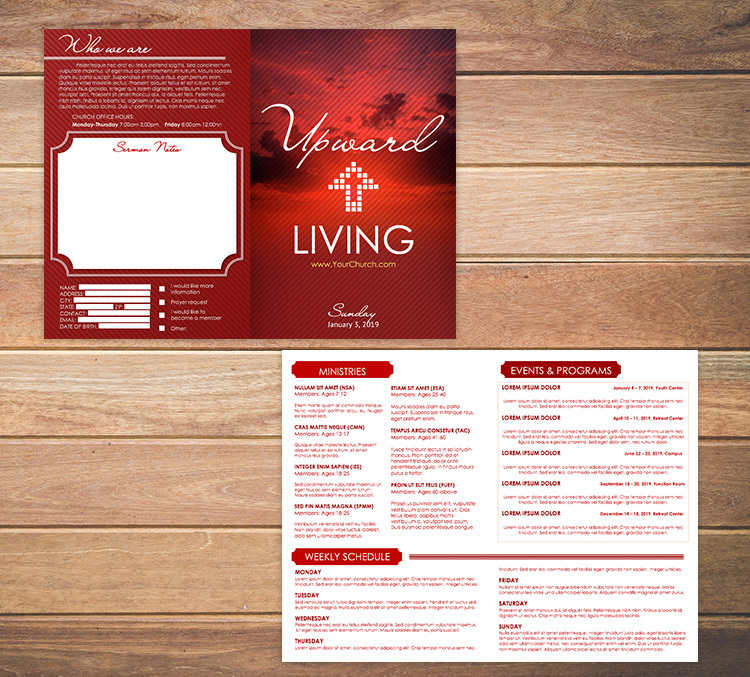 Just enter your name and email address below to get access to your free church bulletin templates today! 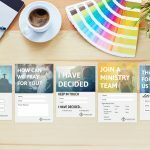 Re-Branding: Should You Change Your Church’s Branding? Are these compatible with Pages on MacBooks? Hi Megan. These templates were designed in and for Microsoft Word, so they are currently not compatible with Pages. Thanks for the encouragement! It means a lot. God bless you. Ca you change the title on these templates?